Sally at Wireworked offered up the opportunity to swap ornaments with another artist. The ornaments had to me handmade by us and had to include at least one art bead. Simple enough right? 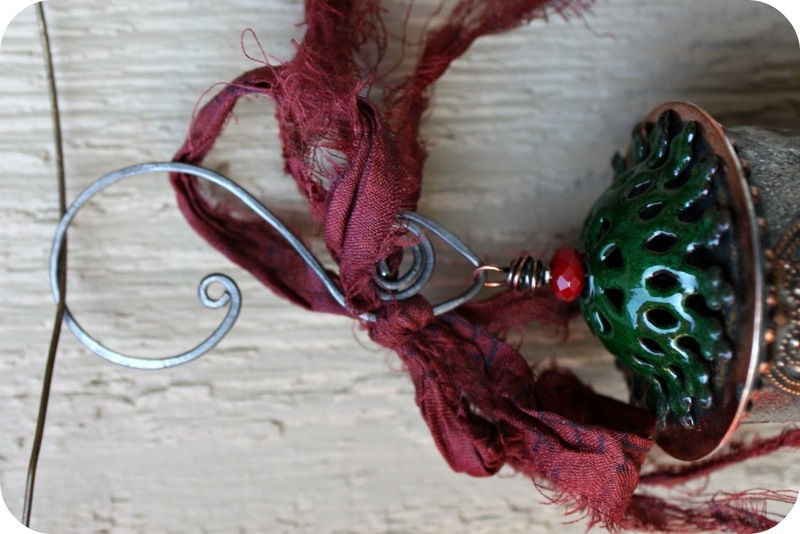 I started by contacting Melissa Meman, my wonderful swap partner, to find out if she had any preferences in the style of her ornament. It seems we both prefer fairly traditional Christmas decorations. Next, I pondered my options for a VERY long time. I went though my small sample of art beads. Finally, I was inspired by this ornament on Pintrest. To make the ornament, I shaped heavy gauge wire into the form of the tree and used small gauge wire to wrap it closed. The heavy wire was pounded flat and glued onto a paper copy of "Oh Tannenbaum" that had already been coated with ICE Resin on either side. Once the wire was secure to the paper, I added just a dusting of glitter to the inner area of the tree and applied a thick layer of ICE Resin to secure everything. Once the resin was good and cured, I punched holes at the outer angles of the tree (3 on each side) I added a "Shabby Bead" to each branch to serve as ornaments and glued the star on top. 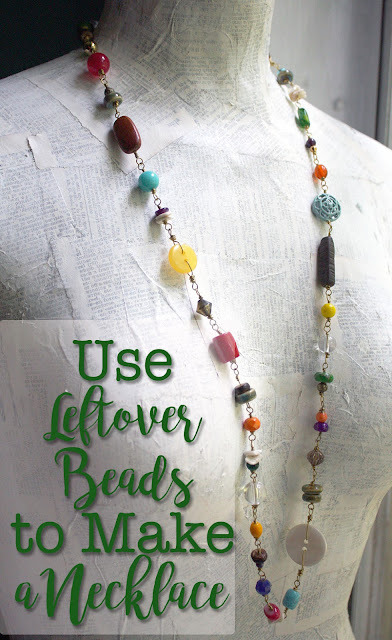 I made my own ornament hanger that included a green enameled bead from Gardanne. NOW, let me share with you what Melissa (the amazing lady that she is) sent to me. She really blew my stockings off with this amazing ornament!! While I used general craft supplies of paper, resin, clay, wood, and glitter; Melissa was busy with metal, enamel, solder, and some heavy tools. Check it out!! 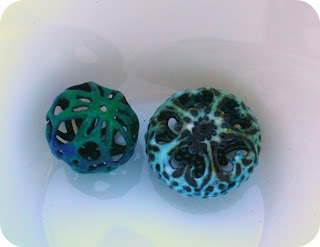 In addition, She sent me some of her own enameled beads. I'll admit that they're so pretty I'm a bit intimidated by them. I'll get over that soon enough I'm sure of it!! THANK YOU Melissa for the wonderful Christmas treasure you've generously made. I don't think it'll be getting packed away with the rest of the ornaments at the end of the season! 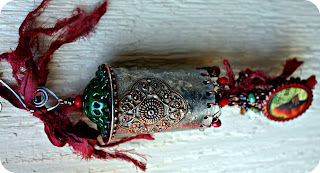 As well, a big THANK YOU to Sally as well for her hosting of the blog hop. I really had a lot of fun giving and receiving! Now, you get yourself to blog hopping!! I can't wait to see what everyone else created!! What a sweet ornament you made. I've never used resin before but I love the idea of using it on the paper. I love ICE and paper - so I love what you did. Thats the fun of the swap - getting something so different! Or so similar! Wont know til the postman elf brings the surprise! Sideways, upside down or right side up, Melissa's ornament is clearly a beauty and very creative! And I love your Christmas tree!!! What a fantastic idea! So festive and classic and just so Christmas! Love it!!! Hope! I love the resin tree!!! What a clever idea and all the little details, the O Tannenbaum paper and how you drilled and hung little beads to decorate the tree and the beautiful star that sits on the top!! I LOVE IT!!! Hope! I'm so glad that you were able to participate in the swap/hop!! Have a very Merry Christmas!!! You and Melissa are a perfect pair! I love that you were able to take an inspiration and work it into something totally "Hope." Enjoy your holidays...at least what's left of the season since it's moving waaaaay to fast! Both ornaments are really wonderful! 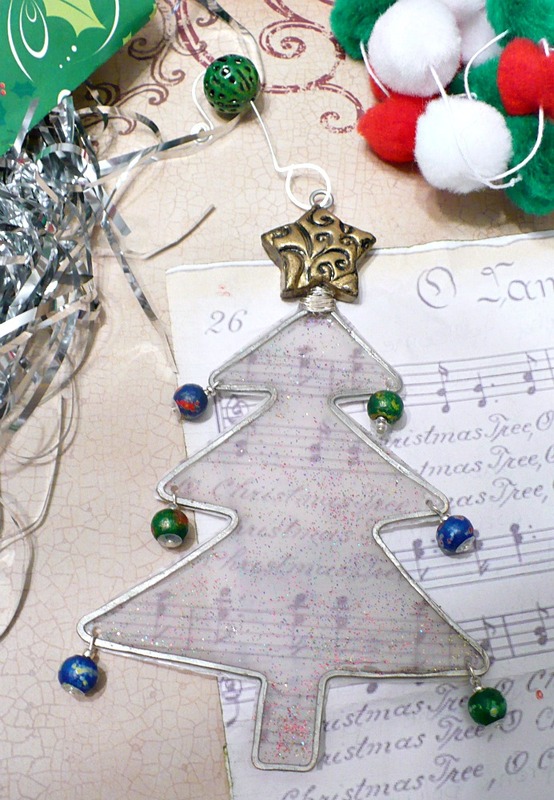 I love the idea behind your ornament, thank you for sharing the process. The star you made from polymer clay is really beautiful! A really fun design! Oh Hope! 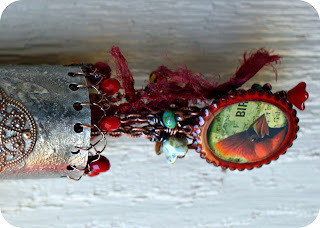 I love the ornament you made, it is so creative and lovely! And the ornament you received is equally creative :) You are two very talented ladies and definitely shone in this wonderful swap! Oh, my goodness! Just when I thought I could not be more impressed with another ornament, I have been! Such beautiful work! Merry Christmas! Nice to meet you, Hope! What a lovely holiday tree ornament you created! I love working with Ice Resin too! Just lovely! What a pretty Christmas treasure! I love what Melissa made for you. SO uniquely Melissa! I love how you thought about the ornament and really made it your own. So pretty! Merry Christmas to you! I think your tree is so cute!! I wish I could have been a part of this - maybe next year - what fun! Hope, what a clever idea. I've never seen anything like your special Christmas tree, even though you started with an idea you found on Pinterest. You sure took this to a new level adding the Ice Resin! 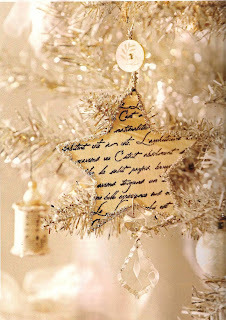 It is such a sweet and classic ornament. 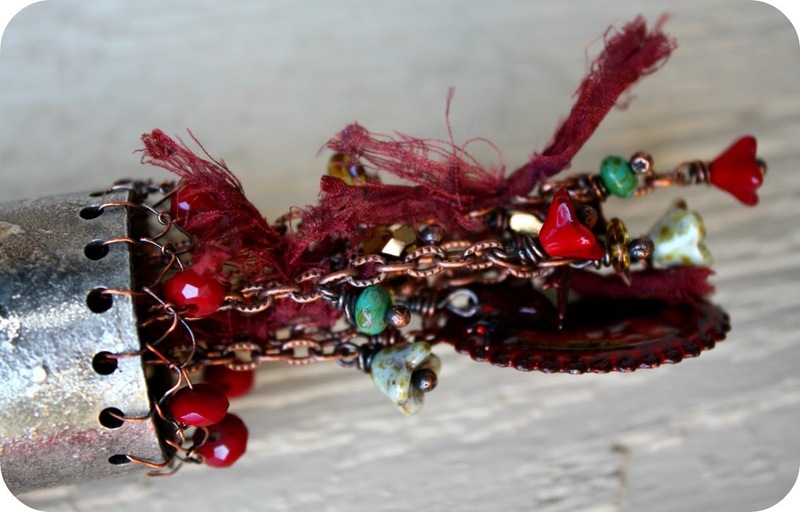 I just love what Melissa made for you as well - it has so many neat components, I could play with it for an hour...I think it would make a great focal for a necklace! Hi Hope, Wow you and Melissa did a great job on the ornaments. I love the tree you made for Melissa very pretty. The ornament Melissa sent to you is gorgeous I love all of the little details she put into it. Wishing you and Pat a very Merry Christmas and a Happy New Year! Jenny- YES! The combination of the two are a lot of fun. And, I do love a swap also. I thrive on surprises. Christmas is the best time for that! :) Thanks for stopping by! Rosebud- Thank you so much. This was a fantastic swap. I'm running behind on hopping around, but am looking forward to seeing all the creativity. Jeanette- I'm so glad you like the tree I made. Isn't ICE Resin so much fun?? THANKS!! Cindy- I'm so glad you like my idea. I definitely wanted to make it my own. Yes, what Melissa made for me is awesome. I could just keep playing with and looking at it. . .It might be a bit heavy for a necklace though! Thanks so much for stopping by and sharing your compliments. Fantastic idea, ice resin is awesome. Love the way you put i together. Happy Holidays!! Wow, Hope, what a great ornament you sent to Melissa and what a great ornament she sent to you! Both fantastic! Anyway, I love your tree ornament! Pinterest is a wonderful thing, but then we're in agreement on that, huh? ;) And what Melissa made for you is just gorgeous!